Increase/decrease the font size or change the colour scheme to suit you. This Timeline (which is a work in progress) charts the development of Entelechy Arts finely interwoven practice over more than a quarter of a century. 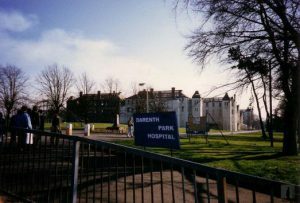 1989 Entelechy Arts established (under the name New Moves) with support from Lewisham and North Southwark Health Authority. Artists worked alongside multi-disciplinary health teams to support adults with learning disabilities to move back into their home communities in south east London from exile in the old mental handicap asylums. 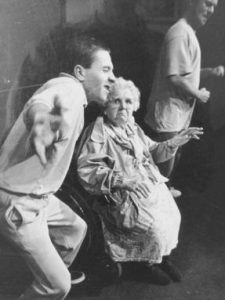 An 8 minute film featuring a collaboration between former residents of Darenth Park Hospital and older performers from Rotherhithe Theatre Workshop’s elders performance company ‘Young in Heart’. Created by artists Caroline Allen, Alan Widdowson, Pip Jones and David Slater in collaboration with participants Aggie Harwood, Charles Long, Jon Gardener, Flo Bell, Fred Pugh, Winnie Wheler, Lil Butler, Lil Cook, Derek Hayter, Larry Doyle. 8 minute film featuring a collaboration between former residents of Darenth Park Hospital and older performers from Rotherhithe Theatre Workshop’s elders performance company ‘Young in Heart’. Created by Caroline Allen, Alan Widdowson, Pip Jones and David Slater. In collaboration with Aggie Harwood, Charles Long, Jon Gardener, Flo Bell, Fred Pugh, Winnie Wheler, Lil Butler, Lil Cook, Derek Hayter, Larry Doyle. A cross generational, science fiction production superimposing the past of Blitz onto the future of information highways and lost pieces of history. Ambient Jam came together with a community from Rotherhithe and Deptford to weave sensory movement, improvisation and dance into a large scale theatre production. 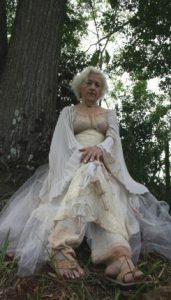 A collaboration between Entelechy Arts Ambient Jam ensemble, dance artist Yolanda Snaithe and musician Charles Hayward. Two performances at the Mulberry Day Centre New Cross combined multi-media Dance, set design and music. This piece was performed to a mixed audience of dance students, artists and choreographers, local learning disabled people, family and care sector staff. 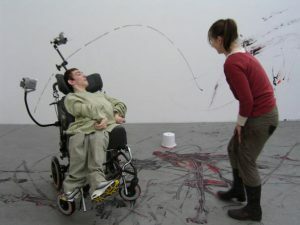 A digital installation using paint, wheelchair tracks and large scale film projections made by emerging artist James Mclean. McLean collaborated with Malcolm and Florence Peake and worked with young people with profound and complex disabilities, and artists at the APT gallery. This was accompanied by a seminar that brought together people from different agencies and organisations to explore the use of digital technology. The outcome was to enable young people with profound disabilities to become more involved in the creative life of their communities. Big Chair Dance took place across London in July 2008 with a final performance in the Clore Ballroom at Southbank Centre. Under the direction of Cheryl McChesney with Choreographer Maresa von Stockert. This was the beginning of a five year relationship with Brazilian Older People’s theatre company Casa das Fases. The relationship brought together older artists from the south of Brazil and the South of London in a series of creative exchanges leading to ‘A Storm in a Tea Cup’ an adaptation of Shakespeare’s Tempest. Project inspired by methodology developed by Casa das fases. Barbican Arts works 2014: National multi-sensory training event designed and led by Entelechy’s Ambient jam team for artists working with people with different ways of communicating. Co-led by emerging artist Carol Greenslade. You can make a huge difference by donating to Entelechy Arts. More support makes more joy available to more people.